Green Tea for Acne: Does It Actually Work? Green tea contains flavonoids, which act as antioxidants and have anti-inflammatory properties, as well as several other substances that can help fight acne. It appears to be particularly powerful in treating oily skin because it can reduce oil production. Drinking green tea alone usually isn’t enough; it should be used as part of a well-rounded skin care routine developed specifically for your skin type. We’ve all heard claims that certain foods can soothe or worsen acne — chocolate makes it worse (only half-true), lemon makes it better (mostly true), and oily food causes breakouts (mostly false). In our quest to sort out fact from fiction when it comes to acne and diet, we took a look at another alleged acne-buster: green tea. Proponents say drinking green tea or applying it directly to the skin can help treat blemishes. But is it all hype? “Staying hydrated is a big part of a healthy skin routine, and that goes beyond water intake,” says Dr. Jeanine Downie of Image Dermatology in Montclair, NJ. The caveat? Green tea is not a cure-all, and it should be used as part of a well-rounded acne treatment plan. Clogged pores, excess oil production, and free radicals are all enemies of clear skin. Green tea contains substances that are known to fight these problems, including flavonoids, caffeine, and polyphenols. Some of these components appear to have more benefit to the skin than others. Flavonoids, for example, have antioxidant properties and can break down free radicals while preventing the buildup of debris that triggers blemishes. Green tea has been used in medicine for thousands of years, most notably as a tool for wound-healing. In ancient times, green tea leaves were used to treat and protect open wounds from bacteria. 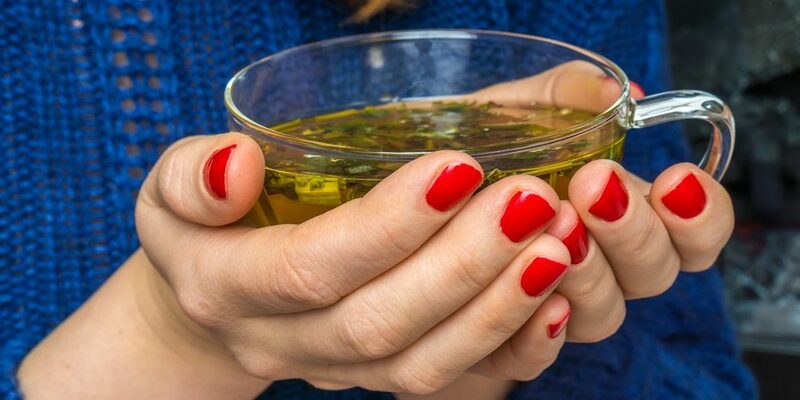 We now know that green tea does have some antibacterial qualities, primarily thanks to the polyphenols, specifically a catechin called EGCG (epigallocatechin gallate). This, coupled with green tea’s antioxidant power, could be of use when treating acne-prone skin. Although results vary from person to person, many people report seeing improvement in their skin after incorporating green tea into their diet. One study showed that the polyphenols in tea appeared to reduce sebum production, suggesting that it could be used to help quell acne and oily skin. Several other studies suggest that green tea applied topically can help clear up acne lesions, primarily by reducing oil. There is also data to suggest that green tea can help other skin disorders. Studies have shown there is some promise for the tea in the treatment of skin diseases characterized by inflammation, including psoriasis and dandruff. In one study, people who used green tea showed slower growth of skin cells, which helps lessen dryness, patchiness, and redness. You can’t soak up all these benefits just from a tea bag. Nowadays, green tea comes in a variety of forms including extract, powder, dietary supplements, and topical treatments. There are two ways to use green tea to treat your skin: systemically and topically. In other words, you can either ingest it or apply it in the form of a skincare product directly on the skin. How much green tea you should drink to clear your skin is up for debate. There is some question about whether or not ingesting green tea has the same impact as applying it directly to the skin through skin care products. When used topically, skin care formulations often include higher concentrations of green tea, which might have more benefit. In addition, it’s unclear whether or not drinking or eating anything can alter the skin in the same way that a topical application can. Although green tea is generally considered safe, it can have side effects when it is taken long-term or in high doses. It’s important to limit your consumption of green tea to less than 500 milligrams per day, because larger amounts can cause toxicity and serious health complications. There are some common — and less serious — side effects associated with green tea, primarily when ingested. People have also reported headaches, nervousness, anxiety, and digestive issues after drinking the caffeine in green tea. When used on the skin, some people experience mild irritation or redness. Be sure that you test your skin in a small area (called a patch test) before applying it all over to ensure that you don’t have any adverse reactions or allergies. If you have a serious reaction from any green tea products, be sure to see your physician right away. RELATED: Can Green Tea Help You Lose Weight? Because there are some negative effects associated with drinking green tea, it is best to use it in forms that can be measured, such as in supplements, creams, or lotions. What’s more, using green tea in topical form — such as in a face mask or cream — ensures that your skin gets additional benefits from the other ingredients in the product. We recommend choosing a green tea-based product that’s designed specifically to treat acne or soothe the skin, such as the Murad Clarifying Cleanser. As with any other skin care solution, the key is to use a mixture of products and ingredients that support your specific skin issues. For example, you might want to couple green tea with a benzoyl peroxide cleanser to clean your pores and a hydrating night cream after application, since green tea can have a drying effect on the skin. The best thing you can do when trying any new skincare regimen is speak with a dermatologist who can point you to the appropriate combination of products for your unique concerns. » To learn more green tea and other natural acne treatments, ask a dermatologist for advice or schedule an appointment using Zwivel’s free online consultation tool.